The kids on the streets of Japan are about to get cute. Although officially celebrated on 15 November, shichi-go-san, or seven-five-three, is a Japanese rite of passage for children that has essentially spread its wings beyond the single day. 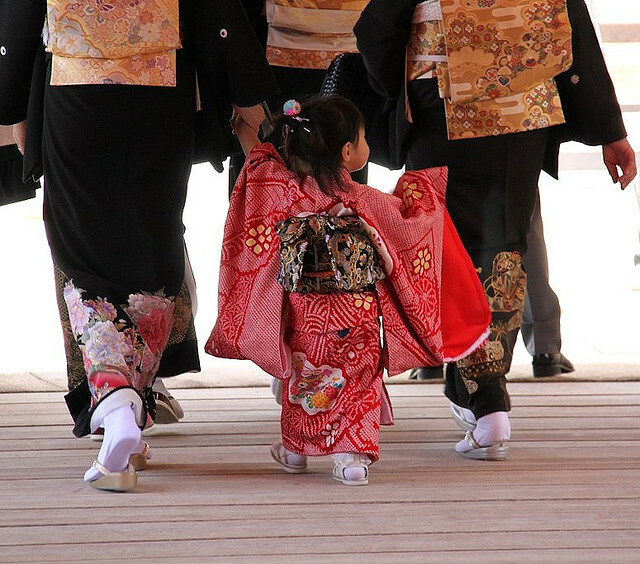 In modern practice, girls of seven and three, and boys of five will dress in traditional style and visit their local shrine for a blessing to drive out evil spirits, ensuring a long a richly rewarding life ahead. Although over the years commercialism has crept into the fray, for once it works in our favour. As the focus for most is now the kimono clad family photograph, the studios of Japan become block booked around the time and people are forced to arrange a sitting ahead of time. This means you get to see entire families in traditional dress for weeks in advance as the celebration is extended into October and people try to find an available space in the local photographers schedule. For many children it may be the first, and for boys possibly the only, time to wear traditional attire and so the faces are often slightly bemused as the youngsters shuffle through the streets of Tokyo. The tradition is open to all though, so if you happen to be non-Japanese and in Japan, you can still take part, the studios providing the clothes and helping you with the intricacies of lacing an obi. And for three year olds it means your parents can now officially stop shaving your head. Though how they used to do this in the first place I have absolutely no idea.